In honor of all that’s on TV and someone’s chance to win a billion dollars, I have decided to offer up my 16 favorite sweet recipes. It struck me the other day that I really don’t share many dessert recipes. This hit me as my facebook feed was filling up with another blogger’s dessert recipes and I realized it annoyed me a little bit. I mean, I can’t keep looking at sweets all day! My thighs expand just thinking about them! Despite the lack of attention I have been paying to desserts, I do enjoy them from time to time. So here are my 16 favorite sweet recipes from around the interwebs for your enjoyment. This is probably the easiest dessert on this list. Anytime I have bananas that are about to get too ripe, I peel them and toss them in the freezer to use in smoothies or this vegan ice cream. If a 1/2 cup serving of real ice cream isn’t enough for you, feel free to go nuts on this “ice cream”! This has become my favorite dessert to make when I have the time to make a proper dessert. I almost always have all of the ingredients on hand since frozen blueberries work just fine here. I sent this with the husband into work and his co-workers destroyed it. It’s great with some vanilla ice cream or lemon gelato. Somehow I forgot to take a photo of this one before we devoured it. Oops! Good news–Angela over at Oh She Glows has gorgeous photos that do it justice. Be warned that the chocolate pie filling is incredibly rich. Plan on small slices and/or add some whipped cream or vanilla ice cream. Love the flavors of Thanksgiving? This is the dessert for you. It’s a much healthier take on pumpkin pie. You’ve seen these on Pinterest, right? Each recipe promises a chocolate chip cookie or brownie hot and ready to eat in a minute. Well, that isn’t quite true. The recipe still includes lots of ingredients that you have to get out, measure, and mix. So it still takes quite a while. But if you are really craving a chocolate chip cookie and you don’t want to make a whole batch, it’s a decent 10 minute solution. If you don’t eat dairy but you miss pudding, your future has just been changed forever. The texture is a bit more like tapioca pudding. I introduced a vegan friend to this pudding and she was so excited to have pudding back in her life. We can debate whether or not we call scones dessert. But when I slather on the butter and blueberry jelly, they are as good as dessert. Even better–you can rationalize eating them for breakfast! My mom used to make a version of these for Christmas every year. She’s scaled back her baking and candy making, but my sisters and I are picking up where she left off and running with it! These coconut bars are sweet and chewy without being cloyingly sweet. No photos again! 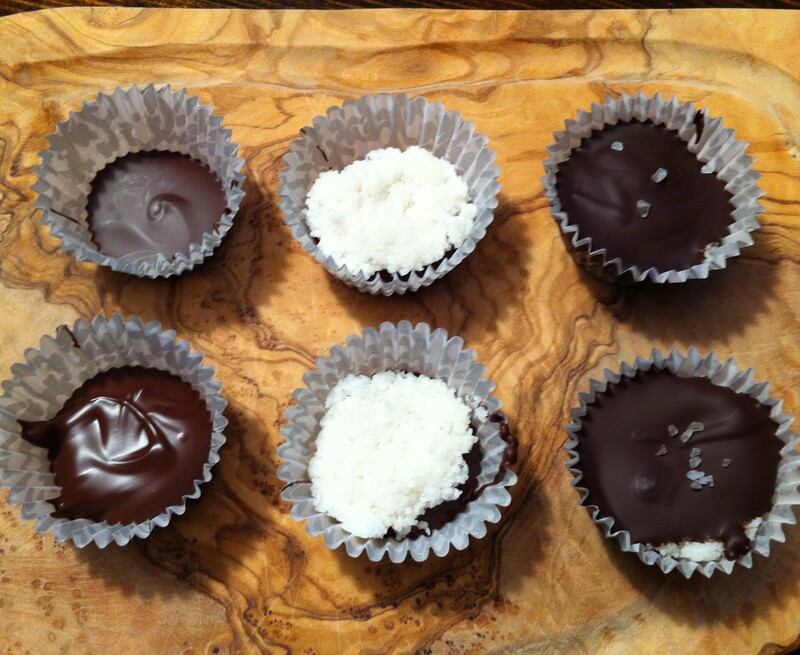 These are just the perfect combination of what I love in desserts: oatmeal, chocolate, and coconut. If there was peanut butter in here, it couldn’t get any better. The link is to the recipe that inspired the photographed blondie. I did a little more work to get it just how I like it, and I will be sharing that recipe soon. But please at least steal the ganache recipe from the link above. Did everyone else know how easy ganache is and I’m just slow to catch up? I will be making this decadent chocolate topping for all kinds of desserts. 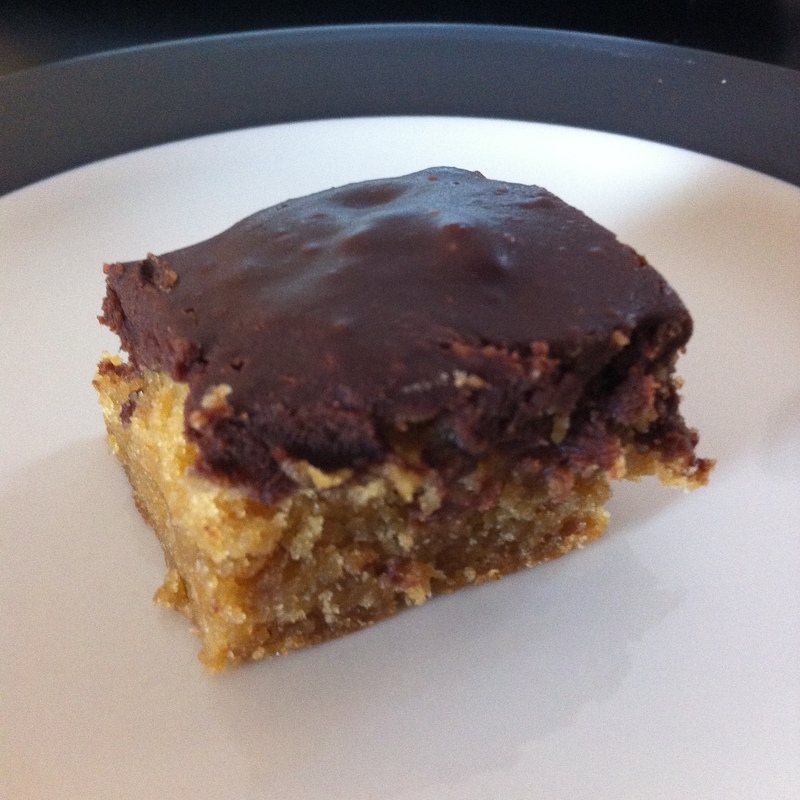 Maybe even the brownies from above…. Cherries, chocolate, nuts, and coconut. Given that you’ve make it to number 12, you could probably guess that this is a combination I would go for. 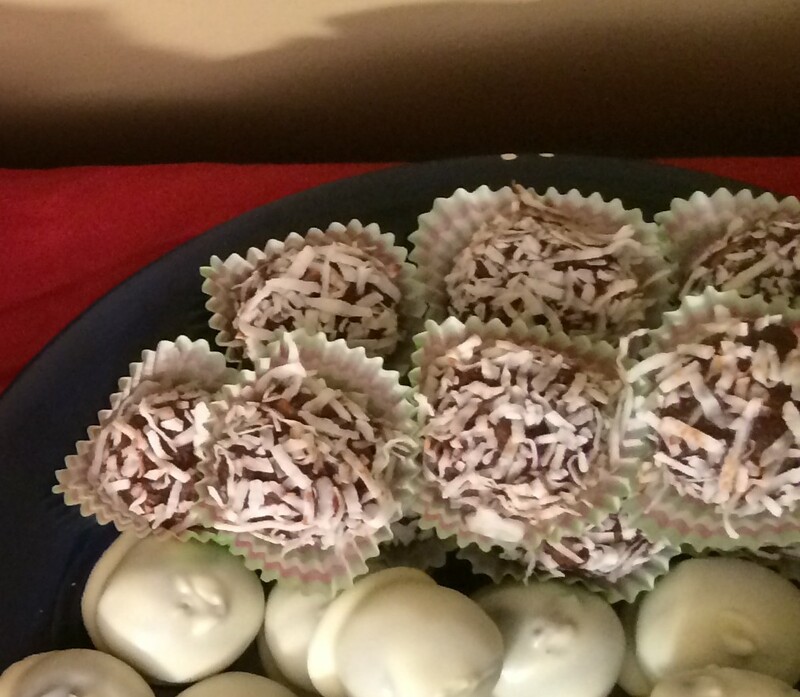 I opted not to dye the coconut with red food coloring because why bother? I made these for Christmas to give away to neighbors and friends. No one complained! These are obviously my cookie of choice for the holidays! 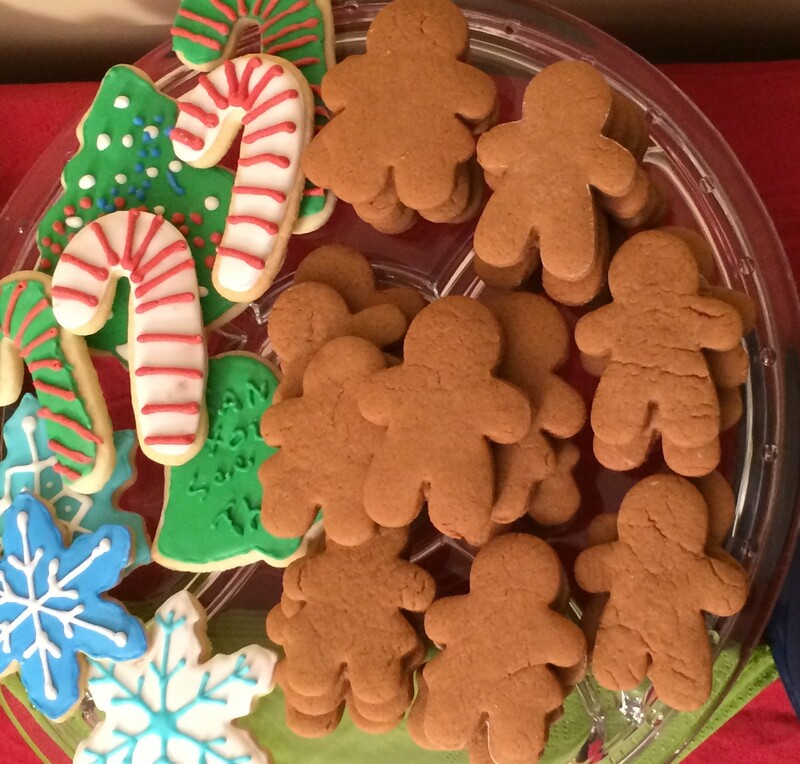 I love gingerbread cookies way more than sugar cookies. In my mind, they don’t even need frosting (as the photo proves). I’m certainly not opposed to eating them beyond December, though! In fact, I’ll be making these with family for Easter in a few weeks. I love the simple ingredient list of these granola bars, but at about $1 a pop, I really can’t rationalize them as a daily snack. Enter Angela from Oh She Glows. She has taken those simple ingredient lists and figured out the secret to combining them perfectly to create cheaper homemade versions. With a strong food processor, these can be yours in about 30 minutes. This recipe is touted for being paleo, but I just like the idea of mint, chocolate, and coconut. I used mint extract instead of oil, and it needed more extract than I imagined. When I had leftover chocolate, I made a peanut butter and powdered sugar dough to make my own Reese’s cups, too. O.M.G. My brother-in-law introduced me to baked brie when he made one with caramelized onions baked in puff pastry, sorta like this recipe. I found this version with dried cherries and almonds and made it for New Year’s Eve. We scooped the melty cheese with crackers and ripped off pastry bits. It was the perfect sweet and savory indulgent treat. It may not jump to mind as the first dessert you’d pick, but I would not be mad if this was served as dessert at any dinner party I was invited to.